l'air de rien: Book thief! Recently, I opened a closet in a hotel which I almost never do. I don't wear suits and I never look into hotel closets but this was Singapore after all, so it all seemed natural. I noticed two books on the top shelf. One was a bible, and the other was entitled 'The Teaching of Buddha' I pulled it down and because I am generally so unbalanced most of the time I immediately opened it up with hopes of finding a quick fix for my condition. I am not a Buddhist, but naturally like other unbalanced souls I know a little about his life. I also have several Buddhist friends. Anyway, It interested me so much that I ran off with the book. I am never much of a thief (honestly!) but I assume that these kinds of books are supposed to be taken; to be lifted especially from hotel closets. After all wouldn't it be happier in the sunshine of Australia than in a dark closet in Singapore? With this rationalization, I read it every morning while drinking strong coffee and I find that it's a great read. 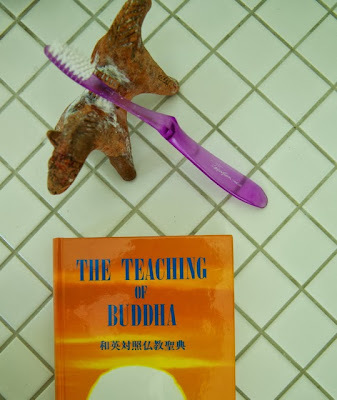 It turns out to be published by a firm in Tokyo: Bukkyo Dendo Kyo Kai (Society for the Promotion of Buddhism) which says that any portion of this book can be reproduced, and quoted by anyone at any time. (Isn't this a nice touch?) They go on to say that they would simply like to receive any such publication which uses the material. This book is in its one thousand & two hundred ninety-seventh revised edition, 2011.